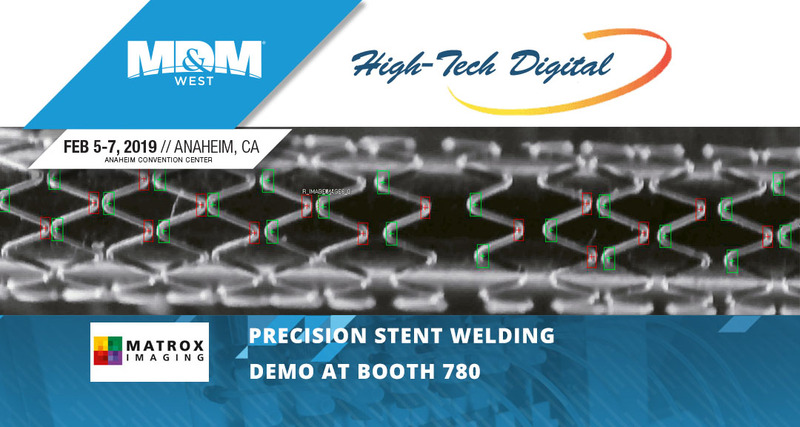 ANAHEIM, CA, February 1, 2019 — High-Tech Digital, Inc. will be at MD&M West (booth 780) from February 5 to 7, 2019, to demonstrate guided welding of metal mesh used for blood vessel stents. The demonstration centers on the use of machine vision as an ideal solution for high-precision laser guidance for metal mesh welding. Blood vessel stents are small metal mesh tubes, medically inserted into weak or partially blocked blood vessels to recover normal or close-to-normal blood flow. Constructed of individual undulating metal wires, a high-powered laser welds the stents, achieving a uniform, reliable joining point. The stent tube is thus expandable and preserves its expanded shape after deployment inside the blood vessel. Machine vision is the perfect solution for performing high-precision laser guidance for welding the metal mesh. Typically, the undulating wire loops are inserted into a metal rod, wherein a standard color camera captures images using standard direct illumination. The images of the mesh provide location feedback, which then instructs adequate alignment just before laser welding. Due to the highly reflective nature of the mesh wires and metal rod, direct reflection or “hot spots” (see image below) caused by the illumination design induces erroneous positioning in about 5% of the production volume. To alleviate this issue, the first step is to redesign the illumination to reduce “hot spots” and highlight the original color of the image (see below). The second step utilizes Matrox® Image Library (MIL) software, first, to optimally convert the color image to monochrome using the Color Projection tool. Once monochrome, Pattern Recognition tools can precisely locate the welding points for laser position feedback. This Geometric Model Finder (GMF) tool can then identify the first model as having left-oriented mesh peaks, and the second model with right-oriented mesh peaks. This tool MIL offers is so robust that it is able to identify joining points that are not immediately on top of the metal rod (now shown as black background; see below). In addition to MIL software, the demo includes a Matrox Rapixo CXP frame grabber paired with a CoaXPress® (CXP) camera, namely, CP70-16-M/C-148 from Optronis, that can acquire 16 MP images at 300 fps. The Matrox Rapixo CXP’s four channels acquires those images at a rate of 50 Gbps, ensuring the high-resolution, high-speed image capture integral for the system’s performance. The High-Tech Digital demo can be seen at booth 780. MD&M West will be held from February 5 to 7, 2019 at the Anaheim Convention Center in Anaheim, CA. Since 1983 High-Tech Digital, Inc. has assisted engineers and project managers in the following high-tech markets: Machine Vision, Medical and Pharmaceutical, Semiconductors, Packaging, Microscopy, Metrology, Military and Defense, Factory Automation, Industrial. We help you find the right vision kits or software for detecting defects, monitoring production lines, guiding assembly robots, or tracking, sorting and identifying parts of all shapes and sizes. 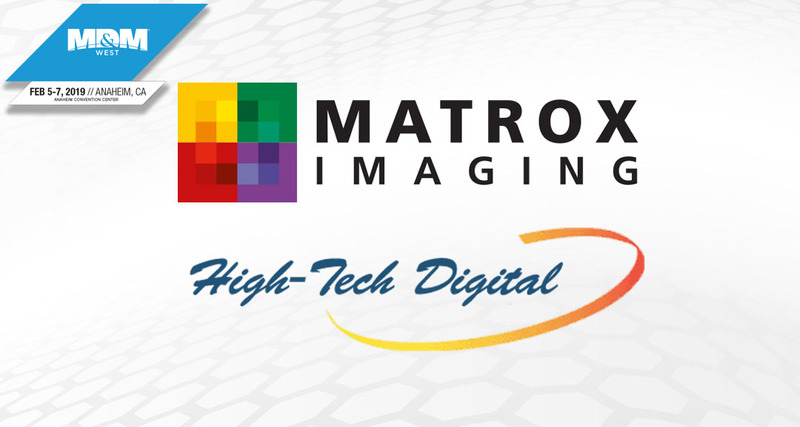 We distribute products from Matrox Imaging, JAI, Basler, Optronis, and Optec.